I just realized it's been a month since the last time I updated our blog! I'll try my best to catch you up on the events of the past few weeks. Our big laundry room remodel project has taken most of our weekend time. We now have a new washer and dryer that are very functional! The washer-dryer combo unit that was here when we moved in had gotten so old that we had to keep the dryer door closed with duct tape. This would turn a typical 3 hour drying cycle into a 4-5 hour process! When the dryer would heat up the duct tape would warm up and slide around, releasing the door. Our new GE set only takes 45 minutes per cycle, and we can fit so much into them! I've already washed our queen size comforter in it! Tom had a business trip to Virginia, during which most of the time I was sick. I'm thankful to have friends and family who were able to help me get to the doctor and kept me from getting too lonely. Hopefully on Tom's next trip I'll get to go with him! I've been busy with a few projects... making couch pillow covers, finishing a baby blanket for my friend's baby shower, and making cards. 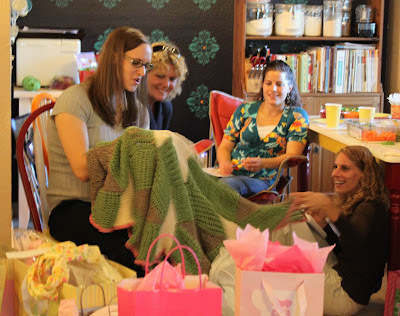 Last Saturday I had about 20 ladies over for Rebecca's baby shower. It was fun to watch her open gifts full of cute girly clothes and fuzzy blankets. We played a few games that I've heard about but hadn't ever seen before. 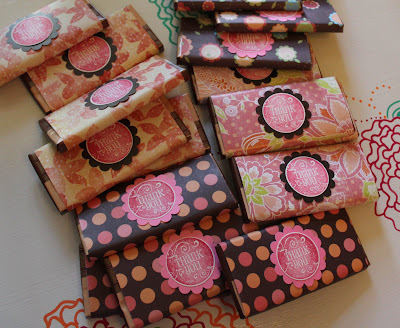 Heather and I spent a few minutes melting 10 different kinds of chocolate bars and spreading them in disposable diapers. 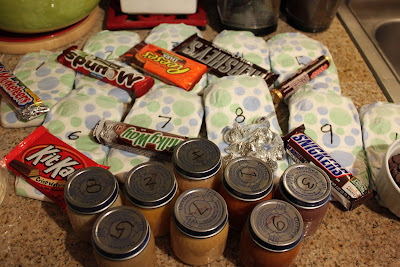 The guests were then able to look and smell them in an effort to figure out which kind of chocolate bar was in each diaper. We also played a game with 8 jars of baby food, minus their labels. Again, I let people look, smell, and taste to decide which variety was in each jar. I had never seen macaroni and cheese baby food before... wow is it bright yellow! On Monday night I was getting dinner ready for Tom and I, slicing some fresh green beans I'd found at Remlinger Farms earlier in the day. While trying to get one finger out of the way of the knife, I managed to stick my thumb in its path. I washed it out but didn't want to look at it, so I waited for Tom to get home to do a better evaluation. He said it was the biggest cut he'd seen and it was definitely down into the fatty tissue. I'd been able to get dinner finished and into the refrigerator so we were able to head out to a walk-in clinic. The doctor cleaned the cut out again, filled my finger with something Novocaine-like, and gave me 3 stitches. The doctor was willing to show us and explain how to tie stitches, which was fun. I have to keep them in for 2 weeks, then either Tom can take them out or we can go back to the clinic. Hopefully that fills you in! We have a few fun things planned over the next few weeks, which I'll try to keep you up on!